Rémy Zaugg once explained that a “work of art and man are inseparable, and are reflected in each other, wholly, unconditionally.” With an analytical approach, Zaugg sought to engage his audience optically and conceptually through often eye-popping, graphic word paintings. He created numerous bodies of work, several of which carry bluntly philosophical titles: About Blindness, About Death, and For a Painting. Each series employs a multitude of text and color combi- nations—some subtle, others aggressive—within reductive parameters such as an unadorned font and a sleek, fabricated finish. The meticulous paintings in the About Blindness series are characterized by an array of short phrases that reflect on sight and participation. 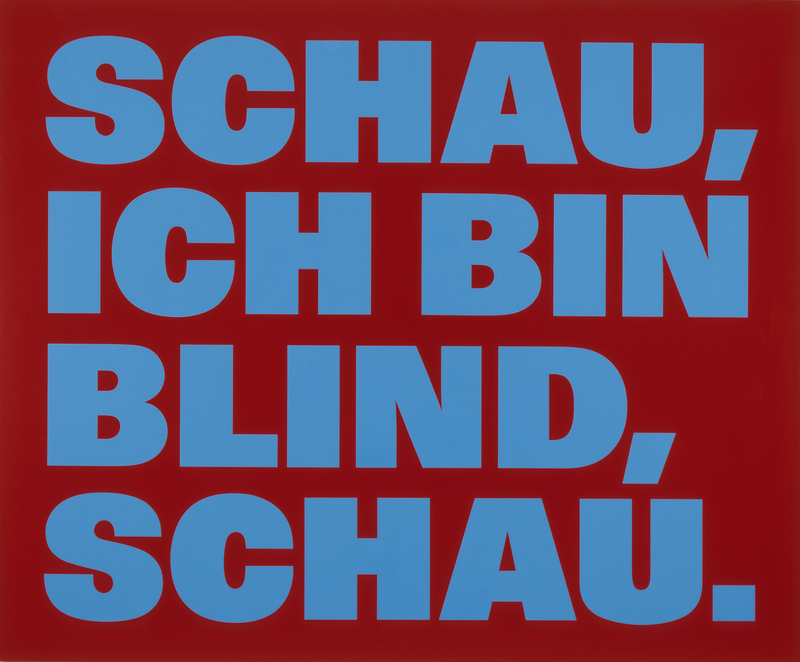 In About Blindness 2 (Über Die Blindheit 2), Zaugg confronted the viewer with the immediate and inconsistent message “Look, I am blind, look!” This exclamatory work commands attention while simultaneously announcing the loss or end of visual perception. The intense, discordant colors of the painting vibrate against each other, so that reading the text irritates one’s eyes. The act of looking thus becomes extreme and even uncomfortable—in front of this painting, the viewer is forced into a position of radical perceptual awareness. Zaugg’s elegant, overtly simple works present ideas of contradiction and paradox that remind us of our own physical presences and limitations.